WOODRIDGE, Ill. -- Don't let the track suit fool you. Chris Chelios is not ready to give up his hockey equipment quite yet. Yes, the unsigned 47-year-old defenseman is serving as a special adviser at the USA Men's Olympic Orientation Camp here at Seven Bridges Ice Arena, but he still believes he can play the game. Maybe not at the Olympic level, but certainly at the NHL level. "I have a different outfit than those three (Team USA coaches) in case you haven't noticed," Chelios said after Tuesday's practice session. "I still consider myself a player. It's awkward, it really is. But, it's a learning experience for me. I've said over the years that I do intend to stay with hockey and this is just one step toward my after career and being involved. "I'm going to play somewhere at the beginning of the year -- whether it's the minors or Europe. I have to play. I have every intention of playing somewhere at the beginning of the year, hopefully it's in the NHL, but if not, we'll see what happens." Chelios knows his NHL dreams are on life support. He freely admits that he has reached to a number of teams only to receive "nibbles" in return. He says he hears the same old refrains about teams being set with their rosters or up against the cap or trying to find out if younger players are ready to stick at the NHL level. Frankly, there's not much of a market for a player that played just 29 regular-season games with Detroit this past season. Chelios understands that. "I'll be waiting by the phone and we'll see what happens," he said. Europe is an option, but not a front-burning option at the moment, he says. "I haven't ruled out anything," Chelios said. "The biggest thing is my family; I don't know about being away from my family. I love the game and I want to play it; but I love my kids more, so we'll see what happens." So could he return to Chicago, where he played for nearly a decade before he was moved to Detroit in 1999? He remains insanely popular with long-time 'Hawks fans. But Chelios wasn't going down that road Tuesday. "I don't even want to start that -- you guys are going to put (out) some headlines," he said, punctuating the statement with an easy laugh. "We're talking about the USA team. I don't want to talk about me." But everyone here wants to talk about Chelios. Not necessarily the Chelios that is on the back-nine of his career, but the iconic American that has represented the United States for more than a quarter century. "You could make an argument that (Chelios) is the greatest American player," said Team USA coach Ron Wilson, who liberally uses the word "warrior" when discussing Chelios. 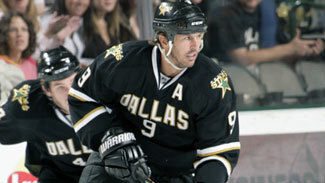 "You could say Mike Modano, Pat LaFontaine, Jeremy Roenick. Chris has been in every one of these battles. He's a true warrior." Chelios is clearly proud of his international resume, which began as a member of the 1980 World Junior Championship team. He first played in the Olympics in 1984, when it was still an amateur tournament. "Twenty-six years with the USA program since Sarajevo and no one can say they have been around that long as a player, honestly, except maybe Modano and (Keith) Tkachuk," Chelios said. "It's great to be a part of this. I can't thank Brian Burke and Ron Wilson enough for giving me this chance." The new breed is happy to have him around, even if it is as a coach. There are 12 defenseman in this camp and only two of them are older than 30. Three of the defenseman here -- Ryan Suter, Jack Johnson and Erik Johnson -- weren't even born when Chelios broke into the NHL with Montreal in 1983. Tuesday, Jack Johnson talked about how intimidated he was to be sharing a dressing room with Chelios, one of his childhood heroes. Johnson said he even wore a Chicago era Chelios sweater throughout his childhood. Every time Chelios has spoken this week, Johnson has listened intently. Wilson says that is by design. The Team USA coach understands the currency Chelios has with the younger players and he has brought Chelios in to be a "tribal storyteller," someone that has lived through all the situations that this young team will face in Vancouver and can relate the wisdom accrued through navigating similar situations. "It's just great to have him around," defenseman Ron Hainsey told NHL.com. "He is what he is -- an American hockey legend."